This administration’s version of the Global Gag Rule could impact up to 26 million women worldwide. In January, women marked one year of Trump’s presidency by rallying in protest, showing they refused to be silenced by Trump’s oppressive regime. But January also saw the first anniversary of the Global Gag rule, the administration’s ban on international-aid funding for groups linked to abortion-related family-planning services. 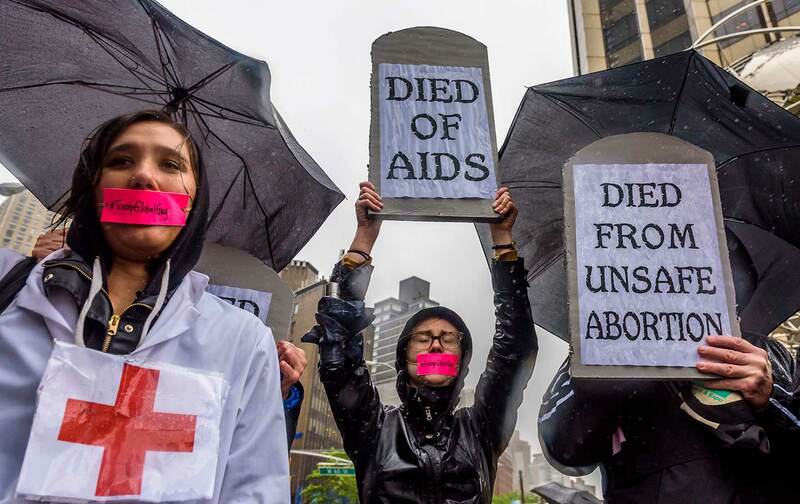 The gag rule does not directly ban abortion-related services in aid-receiving communities but, rather, links major funding from USAID to strict rules on avoiding facilitation or promotion of abortion in any way. USAID is currently a dominant contributor to global family-planning programs, supporting some $600 million in grants for service providers within a multibillion-dollar framework of global health aid. Trump’s gag rule revives Reagan-era strictures on services, and expands them an estimated 16 times, according to the Global Fund for Women. Since the 1980s, the “Protecting Life in Global Health Assistance” rule, unilaterally imposed by the Reagan administration, has been by turns repealed and reinstated, depending on which party holds the White House, most recently with Trump resurrecting the ban by reversing Obama’s repeal immediately after taking office. To burnish his conservative bona fides, Trump drastically expanded the rule to “an estimated $8.8 billion in US global health assistance, including funding support for family planning and reproductive health, maternal and child health, nutrition, HIV/AIDS—including The President’s Plan for Emergency Relief for AIDS (PEPFAR), prevention and treatment of tuberculosis, malaria (including the President’s Malaria Initiative), infectious diseases, neglected tropical diseases, and even to water, sanitation, and hygiene programs,” reports Human Rights Watch (HRW), leaving untouched by the gag rule virtually no health program that women and families need. The gag rule is one of many ways the “developing world” has become an insidious laboratory of anti-democratic, reactionary US policy ideas. While banning abortion-related services in the United States has proven difficult thanks to constitutional protections on free expression, the GOP has ensured that the Global South is not entitled to the same protections. The State Department’s recent six-month review suggests a decline in the number of groups receiving grants, but claims the government is successfully engaging partner organizations to ensure compliance, and that funded activities through major grantees were continuing apace. But advocates for international NGOs say the report masks the real impacts in the field. As for “compliance assistance” from the State Department—one of many agencies left unmoored under Trump, hobbled by political infighting and an unprecedented crisis of understaffing—Sippel noted that some groups in Mozambique complained of “little if any communication between the US government and organizations.” Although USAID’s primary grantees are generally supposed to train the smaller organizations that they subcontract with on regulatory policy, information on the gag rule has been spotty and inconsistent. “There are organizations being forced to comply with a policy that they don’t fully understand, which could needlessly deter women from seeking needed services or put funding grants at risk.” Meanwhile many other groups have forgone US aid grants altogether in defiance of the policy. “Women and girls in about 60 low- and middle-income countries will have less access to contraception, resulting in more unintended pregnancies, and more—often unsafe—abortions,” HRW warns. For those who continue with a pregnancy, a rise in maternal death is likely in aid-dependent communities, “both due to unsafe abortion and to an increase in unplanned pregnancies in places where rates of maternal mortality are already high.” Some may end up carrying a pregnancy to term before they are physically or mentally ready, or suffer the trauma of early marriage or sexual abuse. Even more tragically, many impacted organizations deliver services completely unrelated to abortion, like vaccines for newborns, because they would see their overall USAID funding curtailed for having any connection to services linked to abortion. While American women have constitutional safeguards from being denied the right to exchange honest and fair reproductive-health guidance, countless women around the world are seeing their reproductive rights systematically held hostage by a global lobbying effort to disempower them: not just by restricting their health-care access but also by impeding the social debate around issues of reproductive-health policy in countries with restrictive abortion policies. By politicizing aid, the gag rule also further institutionalizes inequality in health-care access and gender equity, particularly for the women who serve as front-line health-care staff and practitioners in the impacted organizations. Some philanthropic organizations have stepped in to chip away at the rule, the She Decides funding network, for example, has since its inception in early 2017 raised about $200 million, supported by 50 governments and various NGOs. And to counter Trump’s policy directly, some lawmakers have proposed legislation to reverse the gag rule. But for now, the policy remains firmly fixed and financially predominant. The crisis induced by the gag rule reflects a wider crisis facing the international-aid community, which has been plagued by scandal, global “donor fatigue,” and the sheer overwhelming volume of humanitarian needs worldwide. Trump’s aggressive retrenchment tears open an even more personal wound, deepening the suffering of women who face not only deprivation and violence in their communities but also the assault of a foreign power’s global war on women. As always, money talks in the international-aid world, but Trump’s stealth war on women poses a more monstrous threat by using money to silence.